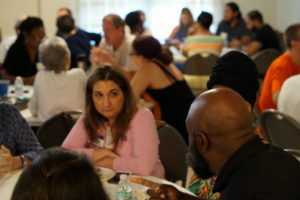 For the past year, I’ve had the privilege of working with a passionate group of citizens in the community of Miami Shores to engage in conversations about race and history. 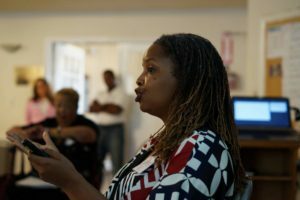 Recognizing the demographic realities, as well as social and political inequities, in their community, the Miami Shores People of Color are on a mission to create an antiracist society in South Florida. Working with the group, we developed the curriculum for a community race dialogue series that we named Unity360. We anchored the sessions around readings that delved into the topic of race and history. We started with a book called Waking Up White: And Finding Myself in the Story of Race by Debbie Irving. The author recounts her painful awakening to the reality of her own whiteness, and the ways it protected and empowered her, while simultaneously excluding and limiting others. The other books were works that focused on race and history: Randal Robinson’s The Debt: What America Owes to Blacks, and my own book, Democracy Abroad, Lynching at Home: Racial Violence in Florida. Group discussion during one of our last Unity360 convenings. Knowing the truth of history, especially the history of groups that have been historically marginalized in the United States, is a critical part of our program because one of the most dangerous manifestations of white privilege is the elevation of what historian Robert Takaki called the “master narrative.” That narrative is centered around the exceptionalism of the United States as a “city on a hill,” the idea of “manifest destiny,” and “liberty and justice for all.” The problem, however, is that these themes whitewash the brutality enacted against Native Americans, enslaved Africans, among many others, thereby offering a sanitized history of the nation. How can we ever move forward together, if we haven’t considered the experiences of all Americans, and how they can be radically different for people who believe they are white and people of color? Moreover, how can we ever truly understand the compounding interest of historical inequities on our present social landscape if we don’t understand the devastating and dastardly policies, enacted or allowed, by elements of our government—from lynching, segregation, disenfranchisement, and redlining—that have created and perpetuated unequal opportunity in our nation. For centuries. This work as been a real joy for me, as it has given me a chance to combine my professional knowledge with my personal passion for creating learning environments. The work continues and I believe the best is yet to come! For more information about upcoming programs, follow Miami Shores People of Color on Facebook.